Suddenly there is quiet – 50 formerly noisy, energetic Grade 3 students have just stepped into the forest. Since they started school, the students have been told they would go to the Big House, now known as the longhouse. For months, they have been working with their teachers and special Aboriginal instructors to gain a base of knowledge they hope will transform into appreciation. The moment they begin their time at Cheakamus Centre, it is clear this not a typical school day. 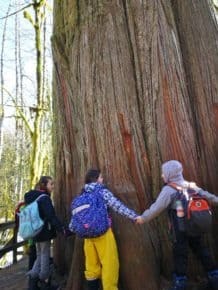 For decades, parents in the North Vancouver School District have been sending their children to Paradise Valley – first on trains; now in school buses for the unique programs offered at Cheakamus Centre – remembered by many as the North Vancouver Outdoor School. But unless you check out the Centre’s Open House, only a few lucky parents get to experience this themselves. Thus it was that LynnValleyLife tagged along with Lynn Valley Elementary on a recent visit to see firsthand what this Indigenous Cultural Program is about. 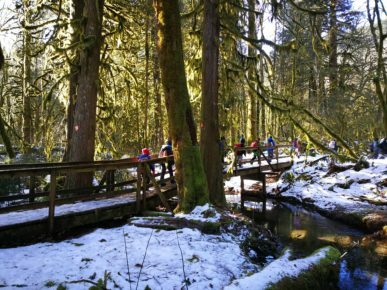 Dusted with snow, the forest glowed as the sun shone through a light fog as students were divided into groups for an interpretive walk. Indigenous Cultural Program Coordinator Sarah Davidson-James and Indigenous Cultural Program Staff Member Mathew Siýámken Williams took the groups along the Ch’iyákmesh (Cheakamus) River. It was clear which children frequently visit the forest and for which this was a rare experience – some walked tentatively on the uneven icy ground while other bounded through the snow. Every couple of minutes Mathew would gather the group to share some ecological or cultural knowledge. Students were encouraged to pick up fallen materials – like moss, lichen or horsetails – to feel or use them as Skwxwú7mesh (Squamish) people did. We learned what plants made what pigments for art or ceremonial purposes. Quickly there were 20 children sputtering into horsetails after Mathew shared they were used as whistles. 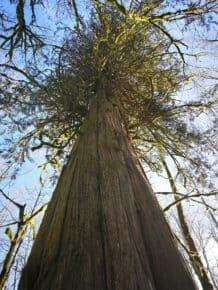 As the walk continued to a 750-year-old cedar tree, a few clear notes rang through the forest. The trees in this area are stunning, but the second growth looks nothing like the ancient stumps that dot the forest or one of the few remaining ancient cedars. It took about 17 students to encircle the base of towering tree. The walk emphasized how First Nations people used and respected the forest. The students were keenly interested in how the Skwxwú7mesh people chose to use cedar trees based on their gender. Women would use female trees and men would use male trees. Another fact that resonated with the students was how Skwxwú7mesh children are taught to harvest cedar bark – people were taught to harvest a strip of bark only as wide as their two hands. If children were gathering, their strips were obviously smaller. The students could identify trees that had been harvested by Sḵwx̱wú7mesh people about their age. Experiential moments like this throughout the day seemed to foster connection – students were relating to information in a much different way than what they learn in a classroom. Skw’une-was (the Sḵwx̱wú7mesh word for partnership), the overnight Grade 3 program is a provincially recognized program tied to the BC Curriculum, said Sepideh Tazzman, communications and marketing manager for the Cheakamus Centre. It began after a conference in 1985 of Sḵwx̱wú7mesh people, North Vancouver District educators, and a few non-First Nations guests knowledgeable in Northwest Coast First Nations culture. Within the halls of NVSD schools the program is known as Skw’unw-was and a much anticipated highlight of the year. The program is based on three major ideas that underlie the activities at the longhouse: respect, sharing, and seasonality, said Sepideh. Those themes ran throughout the experience, from respecting the elders by serving them their food first, to respecting the forest by leaving any souvenirs that students had gathered; sharing of knowledge and cooperating to make lunch; to discussing the changing forest and work needed to survive there throughout the year. A big takeaway for all the students was how Sḵwx̱wú7mesh people had to be patient and plan – nothing was instant like today’s culture. If you wanted a blanket it took five years to gather the wool and another year to weave, according to Mathew. If you wanted to weave hats or mats the cedar had to be harvested and dried for a year before you could get to work. The whispers begin even before the field trip forms go home. They have heard from older students…. The smoke…. 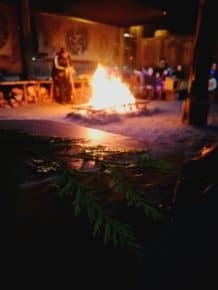 The fire….The longhouse. 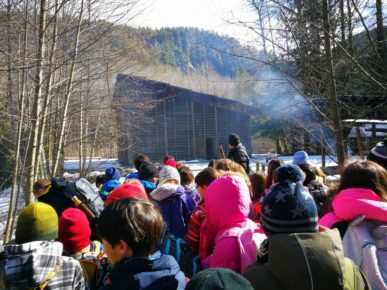 In a day of many memories, the longhouse at Cheakamus Centre leaves the most lasting impression. The imposing – yet cozy – structure is the centerpiece of the program. The students were greeted by Sḵwx̱wú7mesh Elder Henry Khapquolanogh Williams at the bridge leading to the longhouse. Students announced their arrival and he welcomed them to the longhouse and invited them in. The dark, open room was hazy from smoke and warm from fire. Inside Mathew explains the history, some basic building techniques, the core ideas of communal living, the astounding fact that longhouses were moved – sometimes on canoes – to different parts of Howe Sound and Burrard Inlet seasonally. Students were given an overview of Sḵwx̱wú7mesh life, beginning with food. If you ask the kids, the most exciting moment of the program was seeing parent volunteers pull glowing rocks from the fire. Students carefully wiped ashes from the stones with cedar bows, before they were placed inside a pot with water and vegetables. Within a cooking box the veggies boiled and cooked while the children roasted bannock over the fire. Inside and outside the longhouse students cooked their bannock while Mathew explained Sḵwx̱wú7mesh people originally made bread from a flour made from the alder tree and a lichen commonly called old man’s beard. The memorable meal was topped off with salmon prepared by Cheakamus Centre staff. Another key piece of the program is experiencing the traditional day-to-day tasks of the Coast Salish people. Groups of students were able to participate in two experiences, choosing from Plant Gatherers, Wood Workers, Cedar Bark Workers, Wool Weavers, or Hunters/Fishers. 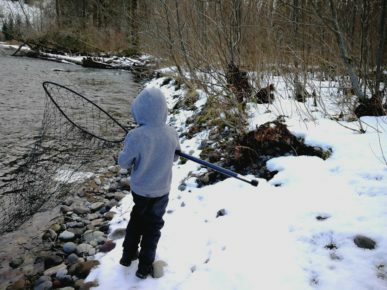 Mathew took the Hunters/Fishers down to the river. It was a humbling moment to learn Sḵwx̱wú7mesh means “People of the Fish Weir” while learning about how they would traditionally fish. The students were awed seeing Mathew pull an obsidian arrowhead from his pocket. They scoured the beach looking for basalt, that flakes in a similar way, and a rock to make their own. After seeing an American Dipper fish on the river it was time to head back and try their hand at weaving. 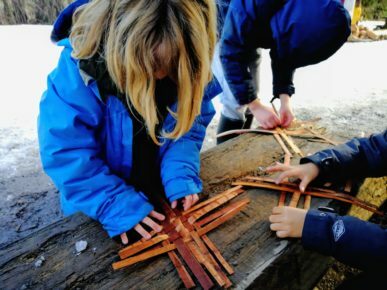 Alongside the longhouse and the outdoor cooking fire, students settled into patiently weaving cedar strips. The slow practice was carefully guide by Elder Henry. He shared photos of elaborate projects inspiring the students to focus harder on their works. Time at the longhouse flies by. Students, parents, teachers and cultural staff gathered around the longhouse fire one more time to share thoughts of the experience. The take-away from the program is that it fosters an appreciation and understanding of First Nations. The personal stories and anecdotes from indigenous cultural staff and elders help students understand that while they are experiencing a portion of history, they are still learning about issues relevant today – jaws dropped across the fire when Mathew shared there are only seven fluent Sḵwx̱wú7mesh language speakers left. These experiences push some kids out of their comfort zones and invigorate others with a deeper understanding of the forest they love. With hair scented with wood smoke students filed back on to the bus with exclamations of this being the “best trip ever.” Osieum (“Oh-see-em”) to Cheakamus Centre and NVSD for sharing it. The 49th Annual Cheakamus Centre Open House is on Sunday, May 6th, 2018 from 10:30 a.m. -3:30 p.m.. When the courts reversed the province’s right to impose class sizes without negotiating with teachers, many parents let out a sigh of relief. More teachers, smaller classes — it seems win-win. 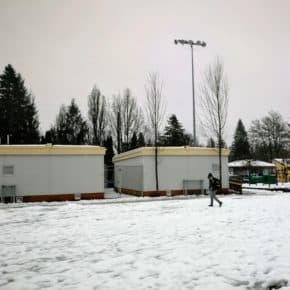 As the North Vancouver School District struggled to conform to the changes, one local school’s playground became an unfortunate victim in the shuffle – and they hope you can help. In August out went the swings, in went two temporary portables. 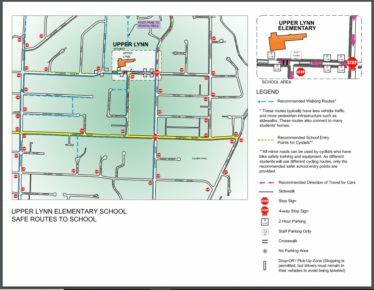 Unlike most other schools in the community, Lynn Valley Elementary has little more than pavement and gravel, said Shore. There aren’t any natural spaces. This prompted parents more than five years ago to start a committee to revamp the area with more natural features and improved playspaces. The process of fundraising and planning began. In the meantime, almost 100 students were added to the school. Swings are the number one feature students requested in a poll the PAC did three years ago to help guide playground plans. At the time Lynn Valley Elementary had three swings and one accessible swing. 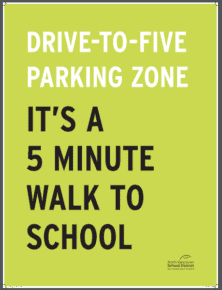 This began a process of assessing school yard space, consulting with other community users and construction. 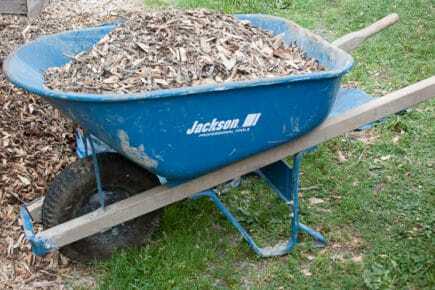 This has freed up some of the gravel to be returned to a playspace. “We would also like to see paths, boulders, logs, trees to reflect the natural beauty of the North Shore. Something that kids can use during school and after,” said Shore. The first step is to replace the swings and add a few features to physically engage students. This is a chance to make the space better, more accessible and to allow more students to play at the same time, said Shore. “We are going to install eight swings and two disc swings that can be used by more than one student or by a child with special needs,” said Shore, adding the first phase will also include horizontal bars, plus all the framing and fill needed for safety requirements. 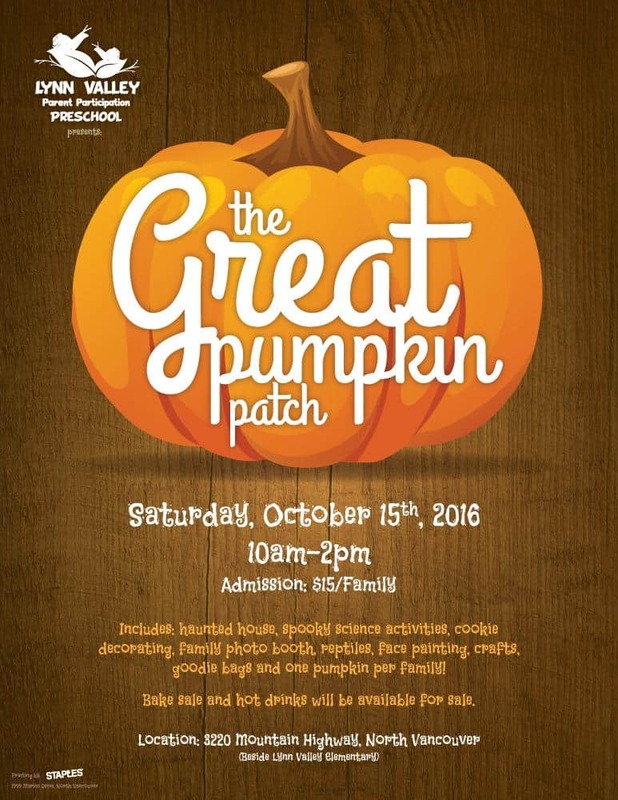 The Lynn Valley PAC is hoping the community will help. To take advantage of available timelines from the school district they have temporarily reassigned funds from other projects to cover costs and is hoping families and community members will sponsor a piece of equipment to finish off the project, said Shore. As a registered charity, the PAC is able to issue receipts for donations of more than $25 or offer public recognition to donors. More details and how to donate are on the PAC’s website. Great fall programs at Mollie Nye House and elsewhere! That “back-to-school” feeling that comes over us in September isn’t just for the young ‘uns. There’s a huge range of community programs designed for adults of all ages and stages, so why not sharpen your pencil (or pick up your yoga mat, or harmonica, or smart phone) and join in? Mollie Nye House on Lynn Valley Road is home to a variety of popular courses, both registered and drop-in. Operations Manager Celeste Whittaker is putting out the call to let Lynn Valley residents know that new beginner and intermediate classes in tai chi/qi gong and English-language training are starting, as is the popular Better Balance with Surefeet program. For information on these and other registered programs at Mollie Nye House, click here. The community has long been awaiting news of the fate of Argyle Secondary. The school district is inviting local citizens to an open house and presentation that will explain the proposal and offer the opportunity to ask questions and put forward your thoughts on several community-related aspects of the project. 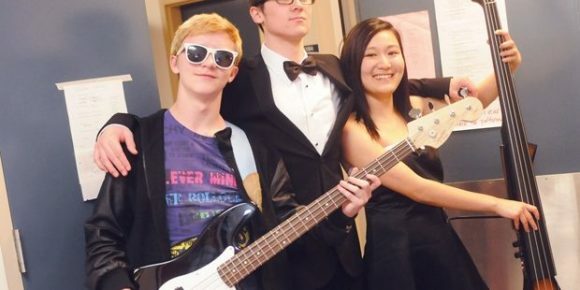 It’s on Thursday, November 24, and takes place in the Argyle school gymnasium. 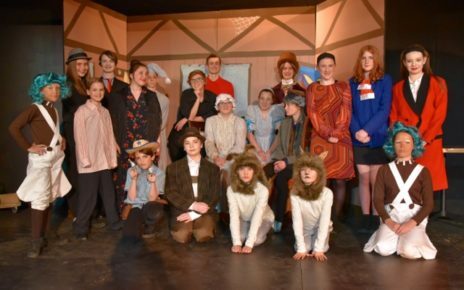 Lynn Valley young people are hitting the stage this month as they take part in a production of Charlie and the Chocolate Factory, presented by SMP Youth. Heather Gawenda tells us that many cast and crew from Argyle Secondary, Upper Lynn Elementary, Lynn Valley Elementary, Ross Road and Boundary Elementary schools are taking part in the production, either under the lights or behind the scenes. In the story, five lucky children find a golden ticket in their Wonka chocolate bars, giving them a rare glimpse inside Willy Wonka’s chocolate factory. What do the children discover on their tour? Oompa Loompas, a chocolate waterfall, trained squirrels, candies with magical properties…and Willy Wonka’s true intentions.